The Armstrong Whitworth A.W.38 Whitley was one of three British twin engine bomber types in service with the Royal Air Force at the outbreak of the Second World War, the others being the Vickers Wellington and the Handley Page Hampden. Whitleys particiapted in the first RAF bombing raid on German territory and remained part of the early British bomber offensive until the introduction of four engined "heavies." It was named for Whitley, a suburb of Coventry, which was home of one of Armstrong Whitworth's factories. Designed by John Lloyd, Chief Designer of Armstrong Whitworth Aircraft to meet Air Ministry Specification B.3/34 issued in 1934 for a heavy night bomber, the AW.38 was developed from the AW.23 bomber transport design which had lost to the Bristol Bombay for specification C.26/31. The Whitley had a crew of five and was the first RAF aircraft to have a semi-monocoque fuselage, with a slab sided structure for production ease. Lloyd was not familiar with the use of flaps on a large heavy monoplane and they were initially omitted. To compensate, the mid set wings were set at an 8.5 degree angle of incidence for take off and landing performance. While flaps were included late in the design stage, the wing remained unaltered with the result that the Whitley flew with a pronounced nose down attitude that resulted in increased drag. The first prototype flew on 17 March 1936, powered by two 795 hp Armstrong Siddeley Tiger IX radials. The second prototype was powered by more powerful Tiger Xis. Due to the urgent need to replace biplane heavy bombers then in service with the RAF an order for 80 aircraft was placed “off the drawing board” in 1935. "off the drawing board". After the first 34 Whitley Is, the engines were replaced with more reliable two stage supercharged Tiger VIIIs, resulting in the Whitley Mk II, that completed the initial order. The replacement of the manually operated nose turret with a powered Nash & Thomson turret still armed with a single Vickers “K” gun and a powered retractable two gun ventral "dustbin" turret resulted in the Whitley Mk III, while the rear single-gun turret was still manually operated. The ventral turret was hydraulically powered but was hard to operate and added drag. The Whitley was re engined with Rolls Royce Merlin III engines in 1938 as the Whitley Mk IV. The Merlins gave greatly improved performance and with the fins modified with leading edge de icers and the manually operated tail and ventral turrets replaced with a Nash & Thompson powered turret equipped with four .303 in machine guns and the rear fuselage extended 15 inches to improve the field of fire, the aircraft became the Whitley V, the most numerous version, with 1,466 built when production ended in June 1943. The Whitley had eight bomb bays in fuselage compartments and wing cells. On the Whitley I and II, the bomb doors were held shut by bungee cords and opened by the weight of the bombs as they fell on them., which resulted in highly inaccurate bombing. The Whitley III introduced hydraulically actuated doors which greatly improved bombing accuracy. The Whitley entered service with 10 Squadron in March 1937, replacing the Handley Page Heyford. By the outbreak of the Second World War, seven squadrons were operational, the majority with Whitley IIIs or IVs, as the Whitley V had just been introduced. With the Hampden and the Wellington, Whitleys bore the brunt of the early fighting and saw action on the first night of the war, dropping propaganda leaflets over Germany. [Unlike the Hampden and Wellington, the Whitley was always intended for night operations and thus escaped the early heavy losses in daylight raids early in the war. Whitleys made the first bombing raid on German soil on the night of 19/20 March 1940, attacking the Hornum seaplane base on the Island of Sylt. Whitleys also carried out Operation Haddock the first RAF raid on Italy, on the night of 11/12 June 1940. The Whitley was obsolete by the start of the war, but over 1,000 more were produced before a suitable replacement was found. A particular problem was that it could not maintain altitude on one engine. 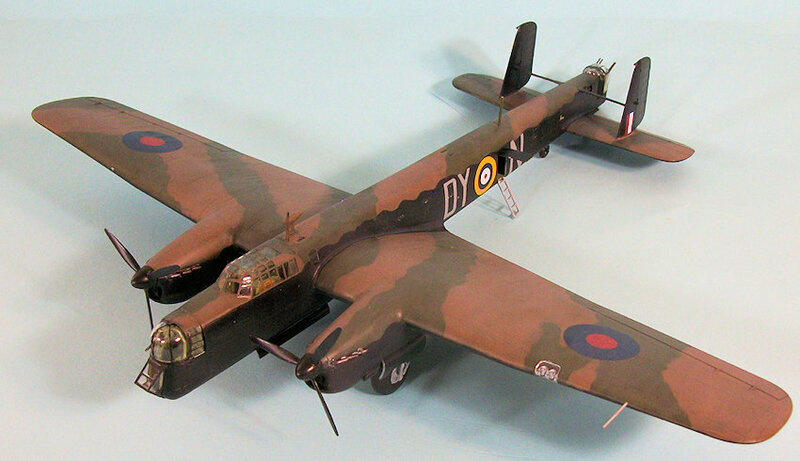 Whitleys flew 8,996 operations with Bomber Command and dropped 9,845 tons of bombs; 269 were lost in action. The Whitley was retired from front line service in late 1942 but continued to operate as a transport for troops and freight, as well as for paratroop training and towing gliders. 100 Group RAF used Whitleys to carry airborne radar and electronic counter measures. In February 1942, Whitleys dropped the paratroops who participated in Operation Biting, the Bruneval raid in which German radar technology was captured from a German base on the coast of France. One of the most fanous Whitley pilots was Leonard Cheshire, who flew the airplane during his first three years of operations. Assigned to 102 Squadron in July 1940, in November 1940 he was awarded the DSO for bringing his badly-damaged bomber back to base. In 1942, Cheshire commanded 35 Squadron, which introduced the Halifax I to service. Working with famed test pilot Eric Brown, Cheshire completed a series of tests on the Halifx that demonstrated the vertical fins were too small. When Handley-Page at first refused to change the fin and disrupt production, Cheshire threatened to take the information public, which resulted in both Handley-Page and “Bomber” Harris relenting, which saved the design. He commanded 617 Squadron after the Dams Raid, and was awarded the Victoria Cross for his leadership in many outstanding missions. In his book, Bomber Command, Sir Max Hastings wrote that "Cheshire was a legend in Bomber Command, a remarkable man with an almost mystical air about him, as if he somehow inhabited a different planet from those about him, but without affectation or pretension". Cheshire would always fly on the most dangerous operations and had no crew, flying as "second dickey" with the new and n ervous to give them confidence. After flying 102 mission over four operational tours by June 1944 (when fewer than half of Bomber Command crews survived one tour of 30), Cheshire was the British Observer on the Nagasaki atomic bombing mission. He was so affected by the destruction he witnessed that he retired from the RAF after the war on medical grounds and became a committed Catholic, involved in charitable work and international conflict resolution. He founded a hospice that grew into the charity Leonard Cheshire Disability, which provides support to disabled people throughout the world. He was created Baron Cheshire in 1991 in recognition of his charitable work. Cheshire founded the Memorial Fund for Disaster Relief, a UK charity in whose benefit the Roger Waters concert “The Wall Live in Berlin” was held. Cheshire opened the concert by blowing a Second World War whistle. Upon his death in 1992, Roger Waters, a lifelong atheist, described Cheshire as "the only true Christian I've ever met." In the 2002 BBC poll to find the 100 Greatest Britons, Cheshire was listed at number 31. His Victoria Cross is displayed at the Imperial War Museum, and the amphitheater of the National Memorial Arboretum is dedicated to his memory. Frog released a 1/72 kit of the Whitley in the mid-1960s, which was the only kit of the airplane available until Airfix released this kit in the spring of 2015. The kit is definitely “new Airfix” throughout, with beautifully-restrained fabric detail and other surface detail, a detailed cockpit interior, and the option of displaying the fuselage bomb bays open or closed, as well as the crew hatches. 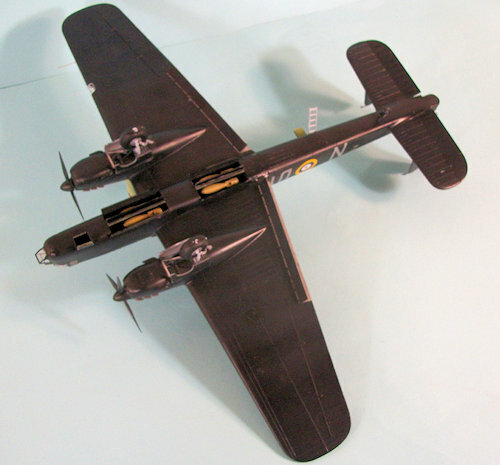 While some modelers may argue that the instruction sheet is merely “one guy’s opinion” of how to proceed, it is best to follow the instructions on this kit, since the assembly of the fuselage can only be accomplished successfully by following these instructions. Even with the “fiddly” aspect of fuselage assembly, there is no real problem in assembly, with the result that the kit can come together completely with about 2-3 hours’ work. From my experience, I would not use the kit-supplied small windows in the fuselage, and would instead use Micro Krystal-Klear white glue for these after painting in decaling. I hand-painted the turrets, while masking the canopy and the other clear parts in the nose. After reading Leonard Cheshire’s very readable “Bomber Pilot,” which he wrote in 1943 with an immediacy that brings the bomber war very much to life, I knew I wanted to do “N for Nancy,” P5003, the Whitley V in which he won the DSO when the airplane was badly damaged by flak and caught fire, despite which he successfully brought it home and saved his crew. I found photos of the airplane on the internet and followed them. I used Xtracrylix RAF Dark Earth, Dark Green and Night over a primer of Tamiya X1 Gloss Black. The Markings were done using decals from the Xtracrylix Whitley sheet, 72221, and the kit decals for the squadron code “DY”. When finished, I gave the model an overall coat of Xtracrylix Clear Flat. I cut the bomb doors open, attached the bombs and the doors in the open position, as well as the foward and rear crew hatches and posed the flaps in the lowered position. I attached the landing gear, then unmasked the clear parts and attached the two gun turrets in position. After completing the model, I discovered a color photo of a Whitley V that demonstrates that only the cockpit and flight deck area was painted Interior Green. The entire rest of the interior, including the interior of the turrets, was painted aluminum lacquer. The kit instructions to do all this in Interior Green are incorrect. The Whitley is singularly ugly, but it has a certain charm that to me is associated with the accomplishments of its crews. 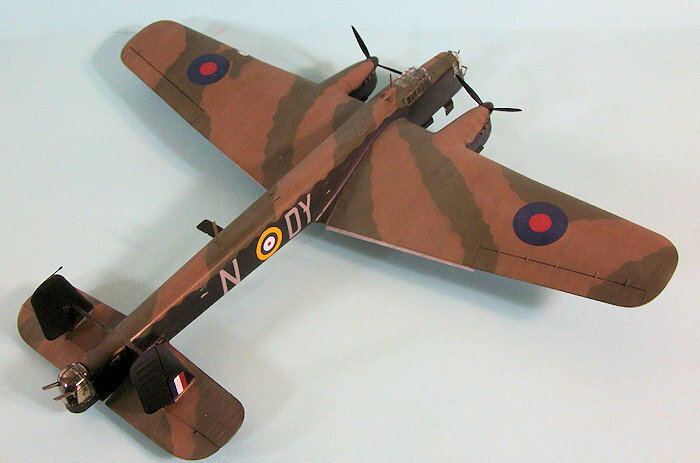 It’s a significant aircraft in Second World War history, and Airfix have created an excellent kit that any modeler with some experience will have no trouble turning into a successful model. Review kit compliments of Hornby-America. Decals compliments of Hannant’s.